This classic stroller lets your child take “dolly” for a walk around the block…or all through the house. Not only is its stunning design and finish beautiful to behold, but its many features serve children throughout the developmental stages of early childhood encouraging role play and storytelling as well as stimulating the imagination. Recommended from 3+ years the Hape Baby Stroller is available to buy from Hape for £45. Hape Home Education range are endorsed by teachers from around the world. 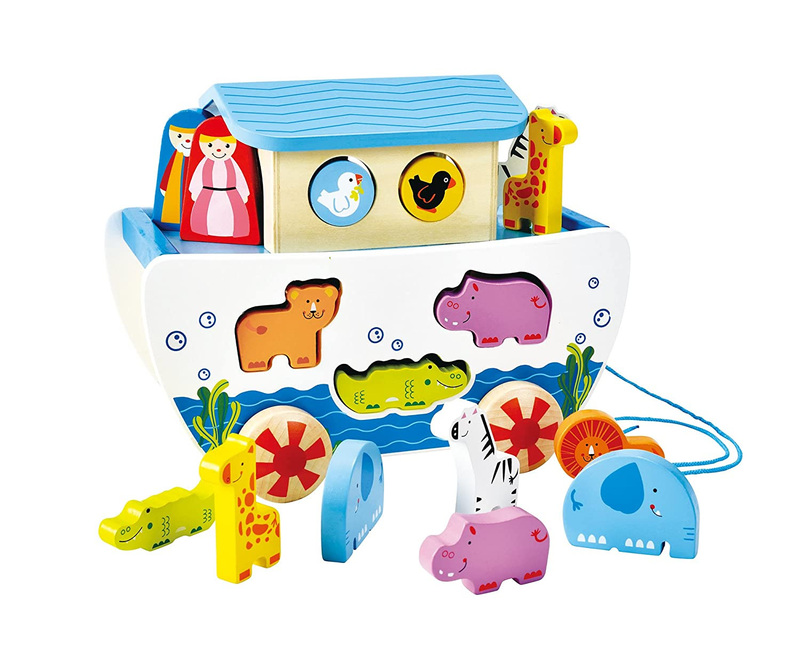 Hape’s beautiful range of home education toys allow for endless hours of fun and play. Each product is designed to enable more versatile play and encourage children to explore and learn. 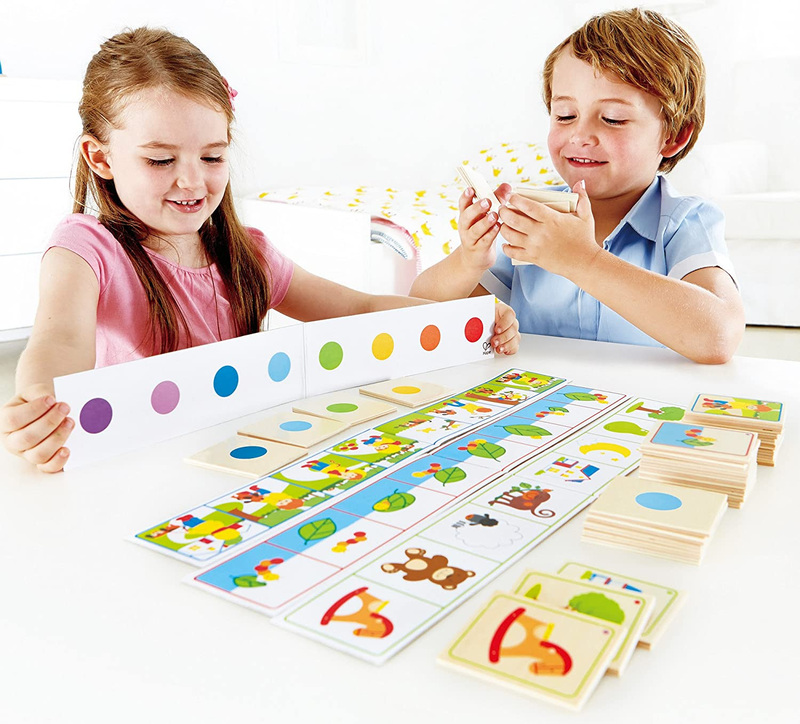 The complete range has been developed to build children’s skills and confidence in a fun gentle way following Hape’s ethos that; ‘children do not play to learn; children learn because they play’. These three products, all part the Home Education range are endorsed by teachers from around the world. Hape Converse, Find, match and describe pairs of opposites. With the converse puzzle set, kids are encouraged to find, match and describe pairs and opposites using brightly coloured picture cards. Its a great way to develop children’s communication skills and have fun at the same time. The set contains; 20 pairs of playing card, 1 red card and instruction’s. The Hape converse set is recommended for 4 years+ and is available from Amazon priced £12.00. Hape Listen to the Clues, Children use their own words to guide one another in selecting the correct picture sequence. ‘Listen to the Clues’ is a great communication game containing 4 game strips for the ‘listener’ and 32 colourful playing cards for the ‘speaker’. The aim of the game is for the players to use their own words to guide one another in selecting the correct pictures to match a sequence. Cooperation and teamwork are a must in this imaginative puzzle game. The Hape Listen to Clues set is recommended for 4 years+ and is available from amazon priced at £13.42. Hape Combino, use colourful transparent overlays to complete pictures. 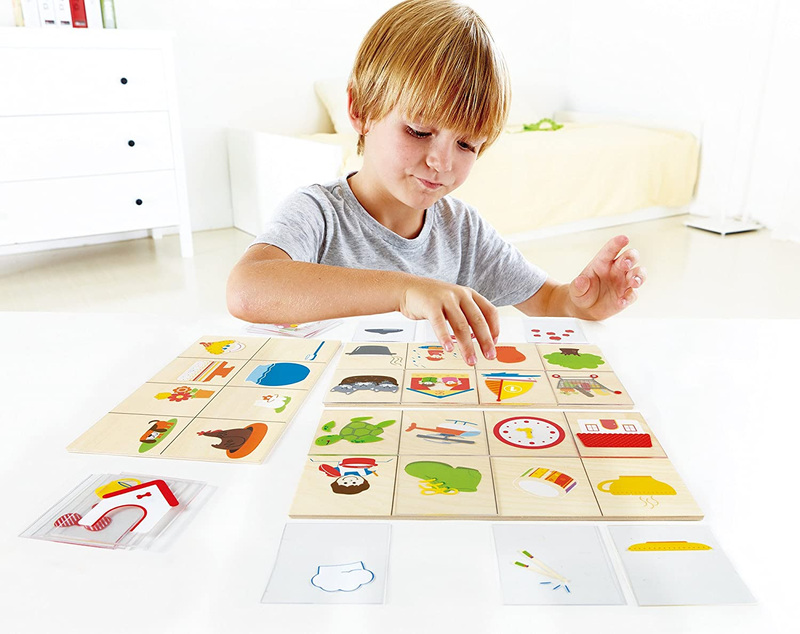 Hape Combino gives opportunities to develop children’s experimental skills as the child discovers the steps to creating finished pictures, using colourful overlays. Some of the most hilarious moments come from the wrong combinations (either by accident or on purpose) making this a great fun way to play and learn. Hape embrace the highest standards in safety ecological and social responsibility. Neither language, nor culture, nor gender impedes the intuitive play patterns. What children see as fun, parents and educators recognize as age-appropriate learning basics; social, sensory, physical, and emotional skills. Using natural materials, water-based paints, and strict quality and safety standards make every Hape toy an investment kids will love and parents can trust. Green manufacturing and satisfying employment for every employee are key to the Hape company philosophy.